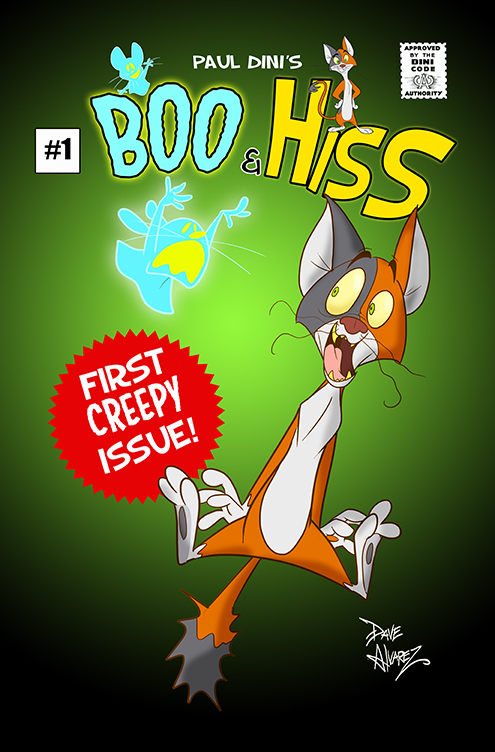 Paul Dini, the writer/producer, best known for his work on multiple Warner Bros. Animation/DC Entertainment animated series, including Batman: The Animated Series and Tiny Toon Adventures, unveils his upcoming 48-page original graphic novel, BOO & HISS! BOO & HISS turns the game of cat and mouse on its (paranormal) head! How many comics and cartoons have you seen where the cat chases the mouse endlessly, rarely catching him and never succeeding in vanquishing his rodent nemesis? In the world of BOO & HISS, that all changes: Hiss (the cat) catches Boo (the mouse) and DEVOURS him. There’s no coming back from that, right? WRONG! That’s where the story really begins! Boo returns as a ghost to enact vengeance on his feline murderer. Wherever Hiss goes, Boo follows, tormenting him in various ways: nearly scaring him to death, possessing his body and making him do terrible and embarrassing things, and just generally making his life a living hell. The cat becomes the hunted and the ghost mouse the hunter in the twisted, comic, scary, and poignant world of BOO & HISS!